Record track log to find your way home later. PathAway is the all-purpose GPS Navigation software. PathAway provides affordable navigational, tracking, and mapping support for aviation, boating, hiking, cycling, touring, rally racing, motorcycle touring, ballooning, scuba diving, fishing, hunting, paragliding, mountain climbing, ultra-light flying, canoeing, snowmobiling, athletic training, outdoor education, geocaching, mapping/GIS, mining, military training, surveying, site inspection, telematics, field data collection, security, search and rescue or any application where location is important. If you get out and go places, PathAway is the companion to take with you. PathAway software has evolved from real customer usage over that past 14 years. The Android version represents the culmination of our experience building world-class software trusted by the most demanding users. Use the embedded GPS in your Android device and use PathAway to navigate. Or attach an external Bluetooth wireless GPS for devices without an internal GPS chip. Web Maps allows you to download maps on-the-fly from a Map Server on the internet. Maps will be downloaded in the background and displayed on the screen as they complete downloading. Maps are cached, so downloading only needs to be done once. Cached maps are always available even when there is no data connection. Webmaps can also be downloaded by selecting an area and downloading the available maps within the area bounds. Google Maps: Worldwide street, satellite, and terrain maps. Terraserver-USA Maps: USGA Topographic and aerial photo maps. Covers USA only. OpenStreetMap.com: User contributed Street Map Community. Covers most of World. FAA USA Sectional Charts: USA and South Ontario Aeronautical charts provided by the FAA. X-Traverse: Subscription based topographical and marine charts provided by http://X-Traverse.com. Free Account access to signup. As you travel, PathAway will center the map on your position and download the map sections needed to guide your way. Display positions in coordinates such as Latitude/Longitude, UTM, OSGB, Quebec-MTM, MGA, MGRS, GGRS87, Swedish Grid, Irish grid, or Israel Grid and more. Capture an unlimited number of georeferenced points, and record detailed names and descriptions. Attach your own custom icon, for easy visual scanning. Record your track as you travel. Then, follow the recorded track to find your way home. PathAway can store an unlimited number of track logs which can be selected at any time for navigation or analysis. Create routes quickly by simply clicking points on a map, or by choosing from your point database. Proximity detection alerts you to upcoming points along your route, or when you get close to one of your points. If you're following a route, PathAway will alert you if you've strayed off-track, or if your elevation has strayed beyond the level stored in the route. 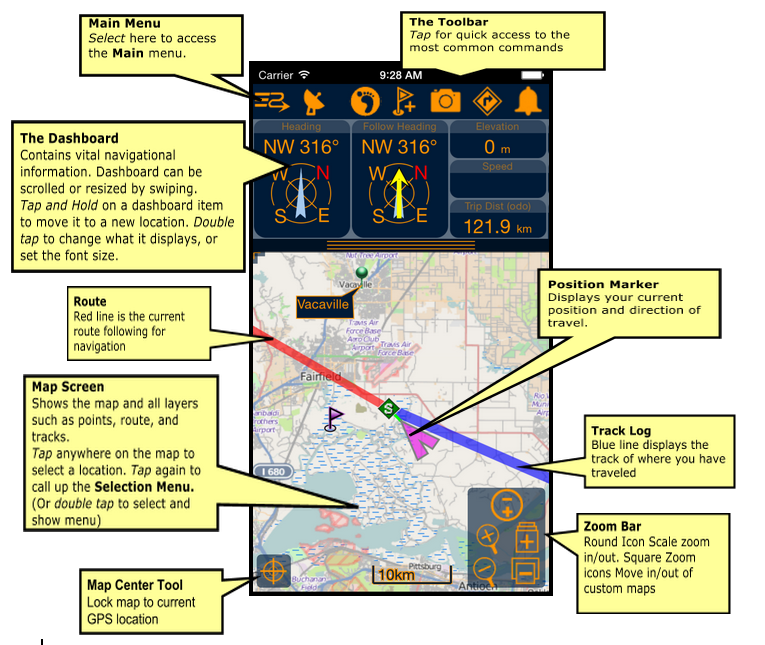 Customizable Large Compass view screens showing Heading, Direction to Next Point, or any other available navigation data. View multiple Compasses on the screen at the same time, or a single large compass. Google Earth KML, KMZ, GPX, LOC, and other formats supported directly on your handheld. Receive audible alerts when a GPS fix is acquired or lost. Display the information you need while still having a great view of the map. Customize 12 edges of the screen to pop-out to show the info. Stats such as ground speed, average and max speed, and vertical climb/descent speed. elevation, geographic coordinates, directional heading/ ground distance/vertical distance/vertical angle to next point, or destination. Odometer, elapsed time, Estimated time en route. Overlay weather forecasts on your maps with clear visualization or animation. Anticipate weather patterns approaching your planned route. Plan adjustments to your route based on the weather forecast overlays. Data includes Wind Speed and Direction, Air Pressure and Temperature, Precipitation, Wave Height, and combined Temp, Precip, Wind, Pressure. Low-res Weather data is supplied by NOAA GFS, hi-res data by from WRF/NMM. Click here for details. Import or create your own maps using our free Map Manager, or third-party Desktop Mapping Software such as QuoVadis/Touratech-QV, or Fugawi. Get maps from mapping web sites, CD-ROM, scanned, or digitally photographed. Maps are highly compressed and can be any size and resolution that fits within your device memory. BSB/KAP Charts Direct Display: Conversion is not required for BSB Maps. Simply import them to your PathAway data folder and PathAway will use them directly. X-Traverse: Download topographical and marine charts directly from http://X-Traverse.com. Free Account to sign-up. PathAway navigation system uses satellite signals to determine your exact location, speed and direction of travel. PathAway uses the built-in internal GPS of the Android devices. GPS is not required to use the software. You can still browse maps, create routes, and mark points on the map in offline mode. - GPS support for devices with internal GPS receivers. - Internal compass utlized when stationary or travelling very slowly. - Customizable screens can display current location, elevation, speed, direction, plus navigational information such as distance,time, and direction to destination. Over 30 different display options available. - Moving map centers on your current location. - Record your track for later back-tracking, or reviewing the journey. - Proximity notification displays points you are approaching, their distance away, and position relative to your direction of travel. - Big Compass screen can show your most important information at a glance. Customize the Compass to suit your needs. - Map Files are arranged in layers so you can zoom in and out of different resolutions of maps. Even set PathAway to automatically switch to the highest resolution map as you travel. - Scroll by dragging map with the stylus. - Maps are highly optimized and compressed for efficient use on memory limited devices. They can be any size and resolution that fits within your device memory. - Maps are downloaded on-the-fly as you travel, or choose an area to download. - Capture and mark unlimited number of points and locations. - Use long names and descriptions for easy recognition. - Apply an icon to each point. - Capture pictures or videos to attach to your points. - Goto points on the map, or points along a track. - Create routes by simply clicking points on a map, or by adding points from your Points database. - Choose a recorded track to follow. - Follow routes either forward or reverse (back-track). Great for finding your way home. - Simulate (play) your route travel before you go. - Determine your total distance and estimated travel time to destination. Time can be estimated by current speed, average speed, or a custom speed setting. - PathAway can record your location at regular intervals as you travel with a GPS. - The track line is displayed on the map as you travel. - You can then reuse the track to follow at a later time. - Time and distance are recorded in the track log, useful for accurate travel planning. Full Screen Map View - Utilizes most of the screen to show as large a map area as possible. Long/Lat, speed, elevation, and direction of travel are displayed. This data is the “navigation” data in the program. Tracking View - Shows the map and navigation data. Default travel stats are related to information specific to your current trip. Route View - Shows the map and “navigation” data, plus full info for point proximity. As you approach a point, “Estimated time to next destination (ete)”, “Distance to” and “Course to” are displayed. 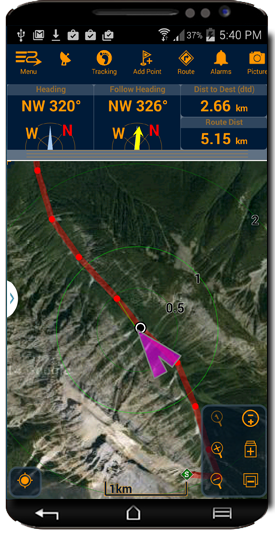 Compass View - Shows the navigation Compass and selected “navigation” data. The Compass view is customizable. The screen can display data in a “Tiled” format, or a single Compass in full screen. Weather View - Shows a control bar for selecting weather type, playing time forecast animation, and controlling transparency of the weather overlay over your map. - Preferences for distance and elevation units, course display, time estimation, proximity notification, map display detail, and track recording precision. - Customizable on-screen Dashboard surrounds the map view. Modify any of the 12 edges of the screen to pop-out to show desired trip info. - Import and Export between GPX, LOC, KML, and text delimited formats. The best smartphone Outdoor Navigation I know. The interactions of the app and its functions have been very positive. We had some great test time on the app this past weekend and showed it off to a large crowd of people. There was a very positive reaction from sample consumers. They really liked that this app is for both Apple and Android phones. - We have tried loading race courses into the app and it is very easy. The app accepts GPX files and displays them nicely. - We ran the app frequently on an iPad mini over last weekend while we we're doing some off-road testing and the battery life of the tablet was surprising how long it lasted on a single charge. - Background tracking was very nice, it seemed to get GPS lock and never let it go! - This allows me to start GPS tracking, turn off the screen to save battery and throw my iPhone in my backpack when we go off into the hills on motorcycles. When we stop or get lost I open the app and see everywhere we have been accurately. - The app is very easy to customize with different dash layouts and color choices. This is awesome. - I really like the ability to label points of interest and have them display. The best gps mapping app for outdoor activities!!! Very easy to use and very helpful when needed. I'm using it since 2003 on a garmin ique and now the android version is just excellent!!! Extremely sophisticated, highly user customizable routing and tracking app, even allows for real time weather overlays and position following by other users. Great new GUI (Graphical User Interface)! Best map app. Works every time and accurate! I would like to commend your program today. On my hike over the Alps (125 km) worked PW5 Pro without error. My tracks were recorded properly and on the external SD exported (Android 4.4.3). I was reliably performed on the track. The program is fast. It works without a long delay. The map view is very good for me. PW5 Pro is for me still the best program. PathAway has to be the best moving map app I've used, and it seamlessly integrates with Fugawi Global Navigator which I have used on the PC for many years and is how I came to PathAway in the first place. So please keep up the excellent work and a fine product! Many thanks by the way for your great piece of software which was one strong reason to go for Android after a period of time with iOS and many years of windows mobile with PathAway. Please continue developing this extraordinary software!! Since last update now runs quite good. Excellent. Use it since long time. Heard about from a collegue. Starting quickly, all (and more) necessary functions. Compared with my earlier program (Fugawi Global Navigator) more stable. Powerfull app!!!! Please go on developing!! I used it for years on the Palm and absolutely loved it. Since the Express version for iPhone/Pad is out I bit the bullet and bought it, and again absolutely love it. I handles your own Bitmaps as well as downloads online maps. It works with TTQV, Ozi and Fugawi. It caches the maps it downloads, so you don't need to download them again. I have for example all the Hema Great Dessert Tracks (Australia) on my iPhone, and quite a view other Bitmaps (Topos) of my local area. Since I have Pathaway I have not once used any other GPS App. Got all of that in the one app. PathAway has long been the best program for GPS to iPhone, Palm and Windows Mobile and Android is finally present. (Original)Pathaway fue por mucho tiempo el mejor programa para GPS para iPhone, Palm y Windows Mobile y finalmente esta presente para Android. Absolutely great for the off-road navigation. I have looked at, installed, or bought more than eight different GPS and mapping apps so far, and Pathaway is the best so far for what my particular needs and interests are. A little bit of background, first. I was looking for an app that handled topo maps well, would allow me to load custom maps, e.g. trail maps, geology maps or campus maps, had good tracking, good zoom in and out, map layers, and customizable data displays for my middle-aged eyes to choose what I thought was important to display. I tested on an iPod Touch 3g with a DUAL GPS cradle. - dynamic map uploads from OpenStreetMaps, TerraServer, etc. This works very well when I am connected. - ability to work in the background, after hitting sleep. This is a big bonus for me. I was able to track hikes all day on one charge using this little gem. My particular GPS cradle uses its own battery for the GPS, and with PathAway running in the background, like music player, I could go six hours and still have 60% charge left. I would only switch the screen on at junctions or to get bearings, maybe every 30 min or so - and my position was up to date, along with my track and progress. - ability to load my own maps. Using the external utilities from the PathAway site, I can load all the USGS geoTIFF maps I want, and PathAway knows how to zoom and scale between different map resolutions. This was a major pain for me in another popular topo map app. Pain gone, now that I am using PathAway. Another big plus, is that I can use Google Earth KMZ files, or even images from other areas. I have old geology maps of my area which I was able to scan, and easily designate lat/lon points on it, and voila! I have another map layer to add to my web maps, USGS maps, and plot layout maps. Just remember that your maps have the suffix ".prc" - probably left over from Palm device days. Oh! and you can import maps created for Palm Windows CE, and other devices over the last many years. - ability to customize the display. When driving, I like to see my speed. In a BIG font. I can do that with PathAway - I can choose what gets displayed, how big, and where on the screen. - easy to export and import maps and tracks. I don't have to mess around with a klunky i-thing web server that never works at work. Just use the iTunes files transfer in the device apps tab. This looks expensive, but I have paid much much more for less functionality on other devices. The inexpensive Lite version also allows uploading tracks, and may suit your needs, but I am quite happy with the Express version. All my other topo and tracking apps will be gathering dust now that I have PathAway. Finally, the raster maps on the iPhone!! And it works great. It's like the Palm, where it worked very well for years. Go through Dropbox, mobileme for transfer over the network, or FileApp or Flash Drive to load the file with the itunes sync (very fast). Really. Now that we have the ability in iTunes to have the file exchange, it is 5 stars. The iPhone has become a great tool for GPS field, really useful. The online web maps are nice, but not good enough for hiking trips for the experienced or in deserted areas (with Touratech 4 for example). All other programs have fallen behind now! MAJ. You can put the cards directly from iTunes and sync goes really well and very fast.I just do the test with maps of India exported for Pathaway (Palm) and is fully compatible. So just super. Now, the dream tool is here!!. Bravo developers! Original French version: Enfin les cartes raster sur l'iPhone !!!! Et ça marche super bien. On se croirait sur le Palm où cela fonctionnait super bien depuis des années. Passer par dropbox, mobileme pour transfert via le réseau, ou FileApp ou Flash Drive pour charger le fichier avec la sync itunes (très rapide) . Vraiment bien. Quand on aura la possibilité dans iTunes d'avoir l'échange de fichier, ce sera 5 étoiles. Mais déjà là, l'iPhone est devenu un super outil de GPS sur le terrain, vraiment utile. Les web cartes sommaires, c'est bien, mais pas assez bonnes pour les balades en rando par exemple ni en expé dans des zones désertes (avec Touratech 4 par exemple). Tous les autres logiciels ont un paquet de retard maintenant... MAJ. On peut mettre les cartes directement depuis iTunes et la synchro se passe super bien et c'est très rapide. Je viens de faire le test avec les cartes de l'Inde exportée pour Pathaway (Palm) et c'est totalement compatible. Donc tout simplement super. Maintenant, des petites retouches d'apprence, et l'outil rêvé est là !!!! Bravo les développeurs! This is it...The only GPS app you will need for backcountry activities like cycling, sailing, hiking, or anything else that takes you off the beaten track! PathAway has been a full featured favourite on Palm and Pocket PCs for years and is finally available on the iPhone. I've tried other hiking and biking apps but nothing comes close to PathAway in versatility. I love the ability to create and import custom maps which show all the detail I need to create routes and navigate on the fly. Routes can be as simple or complex as I want or need. Maps showing different features and levels of detail can be layered on top of each other. Custom dashboards display realtime tracking and navigation information. Scott and his PathAway team have done a great job of putting the backcountry at our iPhone fingertips. Perfect! This is THE off-road GPS navigation program in general. There is no better and certainly not at that price. In addition to online maps now has imported TTQV calibrated maps in PathAway format. Import and export of tracks and routes to function properly with various file formats.The support by the developer is very quick and exemplary. Clear recommendation for all those of the functionality of the Express version is enough. For me, the most "killer features" now implemented. I've been waiting for an app to display any maps, and relatively simple. Relatively because the transfer of own maps is a bit complicated. The killer app for offroad navigation: Custom maps, Web Maps, own waypoints, routing, tracking, configurable interface, what more could you want? Great program for navigation off road. Already known from other platforms like Palm and Windows Mobile. Ótimo programa para navegação fora da estrada. Já conhecido de outras plataformas como Palm e Windows Mobile. I have been using PathAway since 5 years ago on Windows Mobile and it was my favorite application. When I switched to iPhone 2 years back, since then I have been waiting PathAway for iPhone (iOS). There are lots of GPS navigation applications for iPhone but if you really start using this PathAway, you will know the difference at once and will love it. All features are there except importing customized maps in this LE version. This app is the best GPS Navigation App for iPhone. I use to have Pathaway in other devices. Excellent program now in iPhone! I've used and loved PathAway on my Palm handhelds - for years of fun and safety while navigating the Canadian backcountry and long distance walking in Europe. The upcoming Express Edition promises to be just as useful and better looking - with the ability to calibrate and upload custom maps. With custom maps, nothing will be able to beat PathAway 5 for iPhone for awesome flexibility. That will make it a 5 out of 5 stars! In it's present "lite" form it still works well (especially the ability to easily add waypoints and build routes on the fly) and is worth a try. I have used Pathaway for many years along many country paths in Germany and Italy. I can highly recommend the new portable phone Pathaway for Symbian! I use it on a Nokia 6710 Navigator. With PathAway you can use your own maps when navigating off-road. By its clever programming, all necessary functions could be implemented on the tiny phone-keyboard. External GPS devices work fine and help spare battery power of the Nokia. The installation with Nokia Suite runs flawless. With PathAway, you can create your own maps, even aerial photos, and import them. I have downloaded topos, marine charts, aerials, street maps and sectionals. The cool thing is that you can layer maps and switch between them. I have used this for flight, boating and hiking. Pathaway. Ahhhh. Pathaway. The GPS tool of the gods. Pathaway quite literally does everything that you would want a good GPS to do. Its ability to allow you to make your own maps from topology mapping software makes it particularly helpful when you are off in the woods. Its real selling point is the use of GPS Remote Tracking (PRO Edition Only), allowing you to track other PathAway users or allow other pathaway users to track your position from either their own pathaway systems on their phones or on a website. GPS tracking is the killer app for GPS systems but tie a GPS to a cellphone and its really fantastic. PathAway GPS : This is probably the best of the GPS apps we tried out, mainly because of its huge range of features. Perfectly suited to orienteering, trekking, mountain-biking and other outdoor pursuits, it combines the accuracy of GPS location technology with high-powered path-finding and recording tools. 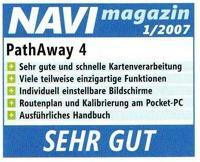 German publication Navi Magazin January 2007 gives PathAway 4 a "VERY GOOD" rating. PathAway Standard and Professional have tons of features and excellent operation. The developers really listen to their customers in the forums and the update cycle is short (sometimes a week between updates with new features). Aside from customization, PathAway comes with some very handy features that work together very well. If you are going to place bets on GPS software, put the money down on PathAway Pro because MuskokaTech has hit a home run with PathAway Professional. I'll have to confess that this is one of those applications I didn't know how much I could use until I tried it out. When I did, I found a number of potential applications. The program is flexible enough that the only limit to making it work with location-based applications is your imagination. The question is not really "What can it do? ", but "When it comes to GPS, what can't it do?" As you begin to see the wealth of applications, the $50 price tag looks all the more reasonable. In fact, as I'm writing this, I'm surprised the program is as inexpensive as it is for all the features it offers. If you're looking for a GPS application to help you while you travel by virtually any mode of transportation; if you're looking for a GPS application that can take you virtually anywhere; if you're looking for a GPS program that isn't limited by the maps that come on the product CD; this is it. Look no further. 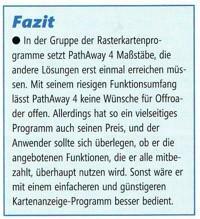 PathAway hat alle Voraussetzungen, die Klasse der Rasterkarten-Programme zu dominieren! Das Programm besitzt schon auf der PocketPC-Seite einen riesigen Funktionsumfang. Track-, Routen- und Waypointverwaltung lassen wirklich keine Wünsche offen. Die reine Movingmap-Funktion bekommt allerdings auch der Anfänger schnell hin. Aber so richtig kommt Pathaway erst im Zusammenspiel mit TTQV auf dem PC zur Geltung. Es gibt kaum ein digitales Kartenformat, DAs TTQV nicht einlesen kann, und alle eingelesenen Karten können erfreulicherweise MIT Übernahme der Kalibrierungsdaten in DAs Pathaway-Format übertragen werden. PathAway has all conditions to dominate the class of the raster map programs! The program possesses an enormous function range on the pocket PC side. Track, Route and Waypoint features really leave no desires open. The pure Moving Map function also gets the beginner working fast. But PathAway becomes even more effective in interaction with Tourtatech-QV on the PC. There is hardly a digital format which TTQV cannot read in, and all maps and calibration data can be transferred directly into the PathAway format. Calibration aide for scanned paper maps is also a natural fit with Pathaway/TTQV. None of the other GPS apps I've looked at are as good as Pathaway. This spring we hiked for 6 days in the south of France and last fall for 5 days in Sweden, both times using Pathaway and maps I scanned and calibrated myself. Have used for a year now Description: You can create your own maps, even aerial photos, and import them. I have downloaded topos, marine charts, aerials, street maps and sectionals. The cool thing is that you can layer maps and switch between them. I have used this for flight, boating and hiking. Thank-you for the fast response in attending to whatever problem in PathAway 4 to make it the greatest mapping software which is unmatchable in the market. I don't think anybody dare to come out with another software to match the functions in PathAway. I have been using PathAway as my primary GPs mapping software for well over a year. I use it for boat trips, hiking, vacation travel, and most frequently, for geocaching. I have spent considerable time trying and evaluating virtually every GPs mapping package available for my Palm PDA as well as trying out many stand-alone hand-held GPSRs and to date, I have not found any other system as feature-rich and specifically suited to my purposes as PathAway on my Palm TX with a bluetooth GPs receiver. The ability to use virtually any map of my choosing has allowed me to load extremely detailed topographical images of the areas in which I go hiking, canoeing and geocaching, and I have actually had the good fortune to visit places and see things I would have missed completely if not for my use of PathAway. Technical support from MuskokaTech for this product has been second to none with new features and problem solutions being made available on a regular basis via the support website. The personal service resulting from the ability to speak one-on-one with the company founder is virtually unheard of in this day and age, and is one of the most personally endearing and important aspects of PathAway and MuskokaTech. As a software developer myself, having the ability to communicate technical issues directly with the person who is the most knowledgeable about the product is unquestionably one of it's strongest assets and helps to ensure my loyalty and continued support for PathAway. Keep up the good work! PathAway v4xx on an iPAQ HW Pocket PC machine has proved extremely versatile. The in-built GPs receiver of the iPAQ is seamlessly utilized by PathAway. The 240x240 square screen (bane of many programmers) is similarly utilized, with a very good screen resolution. Considering the price of the program, backup/upgrading and response to customer concerns are very good. From my perspective, the main value of PathAway lies in its ability to utilize calibrated pixel maps. Although the quality of the original pixel map has to be chosen carefully, zoomed resolution is excellent to perhaps 10m or less "on the ground". My main use for PathAway has been in geological mapping. Excellent topographical pixel maps of Australia are cheaply available from a Govt agency and once calibrated (very easily done), using PathAway to locate the features being mapped is a simple, seamless task. Most efficient and cost-effective. This is a raster (bitmap) based mapping system which cleverly overcomes some of the inherent limitations in such systems when compared with 'professional' vector based mapping. Vector maps occupy less memory and are scalable virtually without limit, but require expensive, specialized software and considerable technical skill to produce and manipulate successfully. Pathaway overcomes the zoom limitation by allowing automatic switching between a large map of low resolution to a smaller map of higher resolution lying within the coordinates of the larger map This can occur automatically when the GPs position enters the parameters of the smaller map, or can be switched manually. The system is feature rich, all of which work very well. Icon and tracking are vector based, extending the capabilities of this small system to an astonishing degree! The GPs to PC screen fix is exceptionally accurate, the best I have encountered so far. All in all, an outstanding application for the Pocket PC. This software is great! I love how compatible it is with my Audiovox VX6700! I use it for everything: Hiking, Camping, Traveling, etc. Highly recommended! I'm using Pathaway on my Garmin iQue 3600 for work in the oil field as well as 4x4 trips. I've been using the map sets that came with my SoftMap Technologies mapping programs, Canada Topo250 and Alberta Topo50. Using these programs it is very easy to load maps into my iQue and use them with Pathway. This is a simple to use, but unequaled powerful software. I used it so far on Tungsten E running on PalmOS 5. The performance at a 8bit color depth is just enjoyable. I've had this program for over a month now, and have scanned in really detailed flying charts. A 4Mb image synchs in a blink of the eye. The sheer no. of features the program has to offer is amazing. I would recommend it to people wishing to use it for flying. My congratulation for this excellent engineering product. c.) it's very stable and predictive. PathAway is the single best program for PalmOS. I'm using it with a Tungsten T-2, Emtac Trine bluetooth GPs, and ETopo digital maps. It is fast and incredibly easy to use, and it does everything you want to do when going out on the land. I use it for hiking, fishing and hunting. I also use it for geocaching, and for data collection to create my own maps of local trails. The on-map navigation is by far the best of any software I've tried -- many times better than Fugawi. Zooming, tiling, and layering maps works amazingly well. Waypoints, routes and tracks are all good. The customizable navigation views are a really great feature. Nothing else even comes close for the Palm. Try this one first -- you won't be disappointed. I've been looking for a GPs program that can tell me how far I rode, walked, drove, etc. as well as tell me where I currently am. Before this program, I used 2 programs and neither one did both tasks like this program did. It not only tells you how far you've traveled, but it will show you the route you took and save it for later use. It makes nice use of the Hi-Res 320x320 Zire 71 screen. If you're approaching a WayPoint, it will not only highlight it for you, it tells you how far away it is (which is great when walking or riding). It uses raster maps (i.e. picture files), but unlike other programs, this one lets you calibrate the map on the fly with the GPs Just pick two waypoints on the map and the map is calibrated. If it's still a little off, you can use the Nudge Controls to tweak it. It's about the best raster map calibration I've been able to find. When I first heard it didn't use vector maps, I wasn't going to download it. But after using all the great features, I promptly registered it. If you're using a Tracking program, Compass program, and a mapping software that requires you to purchase maps, get rid of them and get this program. It's well worth the money. These additions surely make PathAway THE program to have for the "Moving Map" program fans. Thanks for making the world's greatest Palm application (over and over again!). Excellent Software. I Started using a very early version of Pathaway, with my palm m500, and purchased the license, for every problem I've always get an answer from tech support, now I'm using it with a Tungsten and it just works better and better. It's very useful especially for the places where no maps are available (Mexico City). Version 2.0 is really excellent. Most of what I was missing in version 1.2 is now implemented: proximity alerts, extensive tracking parameter configuration (track bias), improved GPs reception feedback (although I'd like to see a sky chart and some kind of warm start for Rand McNally Streetfinder), and enhanced map handling. General arrangement of data on the Palm display is neat and functional with its configurable dashboard. I've been testing quite a few different GPs Navigation Software for the Palm, but PathAway is totally outstanding... The customer support is also beyond compare... My e-mail message was read, the problem was diagnosed and an ETA of the next version was sent to me in less than 4000 seconds. Nice piece of software. This is just what I was looking for. Great companion for my GPs unit even without the maps. Runs smoothly and flawlessly on my m505. Registering it was a no brainer - well worth the price. I purchased a Street Finder from Rand Mcnally for my Palm Vx, that was the easy part... I live in Australia so the USA maps that came with my GPS were no good to me. PathAway solved this problem. I now can scan my maps or download them and away I go. For all you Aussie's looking for an inexpensive way of mapping your travel this is it!! I downloaded it, installed on my palmIII + RandMcNally Streetfinder GPS, and... I Loved it!! My problem was to find accurate maps of strange locations, not covered by TomTom RoutePlanner or other software. Now, I can use Microsoft MapPoint or other PC mapping software to select the zone, with the desired details. Then capture the screen, import in PathAway with the mapping tools, and go! Yes, now I really FOUND my killer application for Palm! A must have, for GPS-addicted guys. See http://www.dauphins.com/gps/gps.html. This is an excellent piece of software. I tried it extensively on my Palm IIIx with RandMcNally GPS. Everything works fine. Importing scanned or digital maps using the Windows tool is easy, defining routes on the Palm just by tapping on the map with the stylus is very efficient. For my cycling tours, tracking was accurate and the 4 different screen views (which can be easily accessed by pressing a hard button) provide all information you want (e.g. position, direction, elevation, current/avg/max speed trip distance, ETA, predefined points of interest in the vicinity). Management of routes and tracks is well implemented. I contacted the developers with some suggestions for future releases (e.g. import/export of tracks). They answered the same day saying they are working on it. Considering that this is the first version of the program and that it is already superior to similar products, the rating is five stars.